I’m a student of film and grew up loving the stars of Pre-Code, through to the 40’s and 50’s. Especially the leading ladies. And no other leading lady captured my young imagination and set my adolescent heart afire more than Ingrid Bergman. I first met Ingrid, the beautiful Swede, as many did in Casablanca. It’s hard to argue Casablanca isn’t the finest American film ever made, largely because of the performances by Bergman and her leading man, Humphrey Bogart. Bergman embodied the role of Ilsa, a young woman with a secret who falls head over heels in love with Rick when they meet in Paris right before the German occupation of the City of Lights during World War II. This we find out in flashbacks, framed in the knowledge that Ilsa betrayed Rick and ever since has been the disillusioned, bitter owner of the most popular watering hole in the desert location on the North African continent. Any film lover will tell you that Casablanca is meticulously constructed. Film students like me pour over every frame of film, literally, in books such as (Warning: Film Geek!) “Casablanca:The Film Classics Library.” But what I only realized just recently, after having watched the movie repeatedly for over twenty years, is the theme of closure. Never having gotten over losing Ilsa, Bogart’s Rick walks around like an open wound, the not-knowing what happened to his lost love gnawing at his guts all these years later. This betrayal is central to the narrative and everything hinges upon what Rick will do once he finds out why Ilsa betrayed him. And maybe even more to the point – whether she ever really loved him in the first place. My favorite scene when I was a kid, was the moment at the airport near the end when Rick lets Ilsa go. But after having loved and lost myself, my new favorite is when Ilsa comes to Rick’s the night before and ends up pointing a gun at his heart to try and get the letters of transit. Rick tells her to shoot – she’d be doing him a favor by putting him out of his misery. At this very moment, Ilsa’s resolve melts and she falls into her true love’s arms. At that moment Rick’s faith in love and humanity is restored by the only person on earth with the power to do so – Ingrid Bergman. Bergman is at her most beautiful in Casablanca. Her face radiates youth and beauty. She exudes a wholesome sensuality that makes everyone in the film fall immediately in love with her and want to help her. We can all relate to Rick, having once been so lucky to have been loved by such a woman, then left standing in the rain at a train station with a cryptic dear john letter melting in his hand, his heart broken in a million pieces. Only an insanely beautiful woman could do so much carnage, made all the worse by depriving her loved one with the reason why; with closure. It doesn’t really matter what the reason is, just the not knowing. That’s when the mind will turn on itself. Fueled by liquor, cigarettes and rage, Rick represents everyone who’s ever had their “guts kicked out” by a beautiful woman. And Ilsa is the only one who can put us out of our misery. I have a feeling that Casablanca will continue to fascinate me for decades to come. No doubt, there are more surprises to come as I live and dare to love again. And having been deprived closure by a lover like Rick, I still would love to know why I had my guts kicked out. But I also know I’ll never get Paris back, because that only happens in the movies. 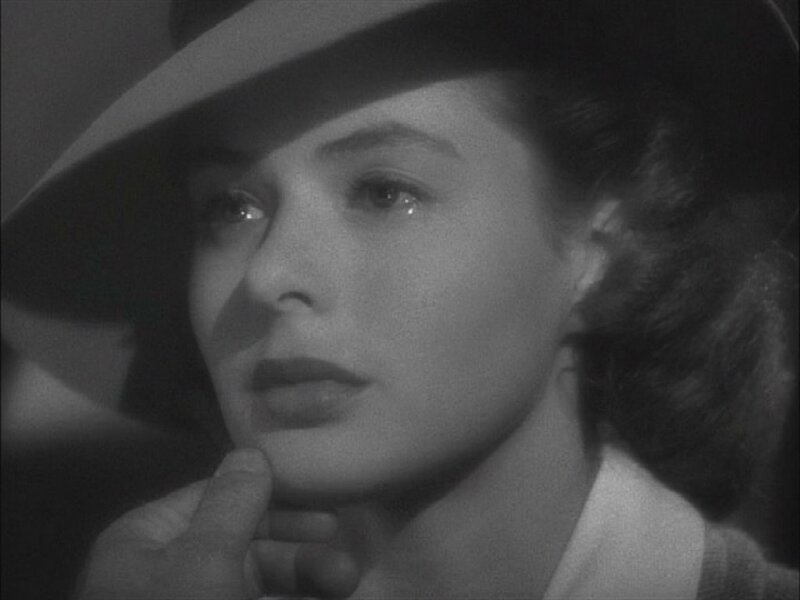 That’s why I’ll never stop being fascinated by Ingrid Bergman in Casablanca. Because she taught me that even though someone says they don’t love you anymore, a part of them always will. The part worth remembering. Paris.